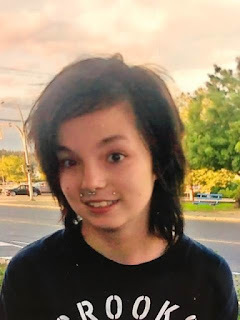 The Nanaimo RCMP is asking for the public's assistance in locating 16 year old Makayla CHANG, last seen in Nanaimo on Sunday March 19th. CHANG is usually very active on various social media platforms but since Monday March 20th she has not posted anything which is out of character for her. Her family and friends are worried for her well-being and have exhausted all avenues as to where she may be. Investigators are following up on information received that CHANG may have travelled to the Lower Mainland with a male in his early 50's who goes by the name of Steven Bacon. Bacon is 5 ft.10, 210 pounds and has white hair. CHANG is a 16 year old Caucasian female who is 5 ft. 1, 110 pounds with dyed red hair and hazel eyes. The picture attached of her is current. When last seen she was believed to be wearing a grey hoody and multi-coloured leggings with scattered stars and planets. If you have information on the whereabouts of Makayla CHANG, call the Nanaimo RCMP at 250-754-2345. If you wish to remain anonymous, contact Crime Stoppers at www.nanaimocrimestoppers.com, text 274637, keyword Nanaimo or call 1-800-222-8477.